Following the martyrs' trail down the Champlain and Mohawk Valleys and visiting all related sites between Canada and Auriesville would take several days. I have broken the journey into segments, which could be pieced together or not. First, let me recommend James P. Millard's website for historical and travel information about both Lake Champlain and Lake George, www.historiclakes.org. Since Lake Champlain is the most historic body of water in North America (not just as a passage to Canada, but for other events, such as Ethan Allen's raid at Fort Ticonderoga, Benedict Arnold's defeat at Valcour Island, as a route for Rogers' Rangers, and for naval battles in the War of 1812). You won't want to miss such places, and Millard's maps and timeline locates everything both chronologically and geographically. It also includes photos of Jogues Island and the Jogues Memorial statue in Lake George. Lake Champlain is 103 miles long and 12 miles wide at its widest crossing, with over 709 islands and 587 miles of shoreline. Seeing it all would be a major undertaking. Fortunately, it is beautiful from almost any shore point. If you are driving, I would especially recommend a visit to the Champlain Islands (including Isle La Motte and St. Anne's Shrine) via the Sandbar Bridge from Milton (Exit 17 on I-89 to Rte. 2 west). Once you've left the bridge, get off the paved Rte. 2 (which goes up the center of the islands) and follow any or all of the shoreline drives on the map. (Rule of thumb: if it's not paved, consider it promising.) St. Anne's Shrine (or www.sse.org) (802-928-3362), has a chapel, gift shop, cafeteria, and picnic facilities. For other attractions on the Islands see www.champlainislands.com or www.islandsandfarms.com., or www.historiclakes.org. Allow 1 day. Visit Shelburne Farms, built in 1886 as a model agricultural estate by William Seward Webb and Lila Vanderbilt Webb, now a national historic landmark, as well as a 1400-acre working farm and nonprofit environmental education organization run by the Webbs' descendants. (Another member of the family, Electra Havemeyer Webb, founded the open-air Shelburne Museum of Americana nearby.) The lake views are spectacular from many points on the farm's 8 miles of walking trails. But please don't miss the extraordinary buildings on the farm. The original residence is now an inn, and the enormous brick barns (resembling chateaux more than stables) house cheesemaking operations, a children's farmyard, and educational programs. Guided tours of buildings and gardens are available. Located at 1611 Harbor Rd., Shelburne, VT, 05482, (802) 985-8686. Open May 17-Oct. 9 (2003). Admission: $6 adults, $5 seniors, $4 children 3-14, children under 3 and members free. Reservations for breakfast, dinner, and accommodations at the Inn at Shelburne Farms: (802) 985-8498. www.shelburnefarms.org Allow 2-3 hours. Map to Shelburne. Burlington Waterfront Park, at the foot of College St. ( map), features the Burlington Community Boathouse, a café and promenade. Hourly and daily boat cruises and rentals leave from the Boathouse. (See below.) Allow one hour for the park. the lake between Colchester Point and almost to South Hero island on a spectacular old railroad bed, built from castoff marble chunks (some as large as mini-cars) hauled in the 19th century from the Vermont Marble Quarries in Proctor. The "fill", as we call it, gives views across the widest and deepest (400 feet) part of the lake. The 13-mile roundtrip bike route includes a bike ferry shuttles ($1 each way). The path can also be picked up at Burlington's Waterfront Park (above). Bike ferry: daily summer service; weekend spring & fall service. Allow 1 day. For ferry schedule and bike rentals: Local Motion, 1 Steele St. #103, Burlington, (802) 652-BIKE, or www.localmotionvt.org. Skirack at 85 Main St. in Burlington (800) 882-4530, also rents bikes and inline skates on hourly or daily basis. 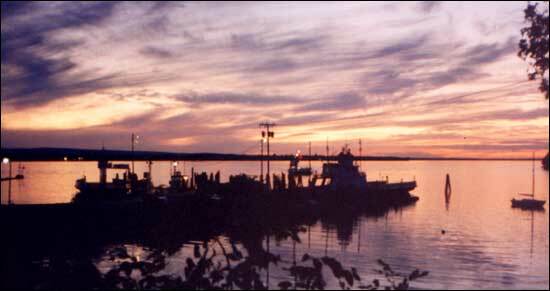 Sunset at the ferry docks, Grand Isle, Lake Champlain. Photo by Sherrill Harbison. If you are driving to Vermont, you can cross the lake on one of the three Lake Champlain Ferries: Essex NY to Charlotte VT; Port Kent NY to Burlington VT; or Plattsburgh NY to Grand Isle VT. For directions, rates and schedules, call (802) 864-9804 or see www.ferries.com. Brochures also available at gas stations, motels and restaurants. Winds of Ireland: captained sailing cruises three times daily, full- and half-day sailboat rentals, weekend or weeklong sailing charters. Based at Burlington Community Boathouse, (800) 458-9301. The Island Runner passenger ferry operates weekends and holidays between North Hero, VT ( map), Knight Island, Burton Island, and Kill Kare State Park. Schedules and information, (802) 524-6021 or (800) VER-MONT (837-6668). To go it on your own, you can rent canoes, kayaks, and motorboats from Waterfront Boat Rentals, Perkins Pier (bottom of Maple St., map), Burlington. Paddles, lifejackets, etc., provided, reservations recommended, deposit required. (802) 864-4858. Ferry Watch Inn , 121 West Shore Rd., Grand Isle, VT (802) 372-3935. An 1801 farmhouse B & B with 800 feet of private beach, lake view from every room. Enjoy sunsets over the water and the Adirondacks, and watch the ferries ply the lake. South Wind Market & Café, Rte 2, South Hero, VT, (802) 372-3721. Lunch spot and basic groceries. Aqua Vista, Rte 2, North Hero, VT 05474, (802) 372-6628. Five sleeping cabins for two, immaculately maintained, lake views. Hero's Welcome, Rte 2, North Hero, VT 05474, (802) 372-4161; (800) 372-HERO. Combination deli, general store, gift shop. Fisk Farm, Isle La Motte, VT 05463. Historic, secluded B & B. (802) 928-3364. Heart of the Village Inn, 5347 Shelburne Rd. (U.S. Rte 7), Shelburne, VT 05482, (877) 808-1834, (802) 985-2800. Elegant Victorian B & B.
Café Shelburne Français, Shelburne Rd. (Rte 7), Shelburne VT 05482, (802) 985-3939. High-class dining, reservations necessary. Gillian's Restaurant, 97 Falls Road (at the Village Green), Shelburne, VT 05482 (802) 985-3964. Informal breakfast and lunch spot with good fresh food. See listings under the Burlington, Vermont tour. The museum is open daily, 9:30-5 (closed Thanksgiving, Christmas, New Year's Day), admission free, donation suggested. (518) 474-5877. It is located in downtown Albany, in the Empire State Plaza across from the State Capitol. From N.Y. State Thruway Exit 24, take I-90 toward Albany and exit onto I-787 South. Take I-787 to the Empire State Plaza exit. Or from Thruway Exit 23, take I-787 north to the Empire State Plaza exit. Visitors' parking underground, beneath the Plaza. I have no personal experience of staying or dining in Albany. These websites should be helpful. Directions: Traveling from the east: From the Thruway take Exit 27 (Amsterdam), to Rte. 30 north a very short distance, then west along Route 5S six miles to Noeltner Road. Traveling from the west: from the Thruway take Exit 28 (Fultonville) and continue east two miles along Route 5S to Noeltner Road. The Albany Airport offers Limo service (518) 762-2403. I have no personal experience of staying or dining near Auriesville (other than at the shrine's cafeteria), but the following websites for the Leatherstocking district should help.